Alex Waller has warned Saints of the danger Newcastle Falcons will pose at stadium:mk on Saturday. The Falcons will be heading south having suffered a 39-27 Aviva Premiership opening-night defeat to Gloucester last Friday. Saints also go into the game on the back of a loss after the 13-12 reverse against Worcester Warriors at Sixways. 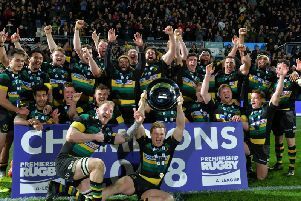 And Waller knows Newcastle will be no pushovers this weekend, citing January’s narrow 39-31 win against the Falcons at Franklin’s Gardens as a reason to be wary. “Their result last week wasn’t ideal, but they came back well against Gloucester in the end and they are a dangerous side,” the prop said. “We’ve got to respect them. “They pushed us close here and up at their place last season. They were tough games. Saints also lost their first away game last season, slipping to a 20-16 defeat at Wasps. But they bounced back with a win at Newcastle a week later. And Waller said: “We lost our first away game last year and we did this year as well, so it’s not ideal but it’s about learning playing away-from-home-rugby, which is different to being at home. “It’s one of those things - you’re never going to win every game, even though we’d love to, and we’ve got to take it on the chin.